Everything. Great location and the apartment was very clean and comfortable. Would definitely book again in the future. It was in a very central loacation, just a few minutes walk from the sity centre. Surrponded by plenty of places to eat. Apartment was very clean and comfy. Ideal location for sight seeing. They some bottles of drinking water. Sofa seat need to improve. 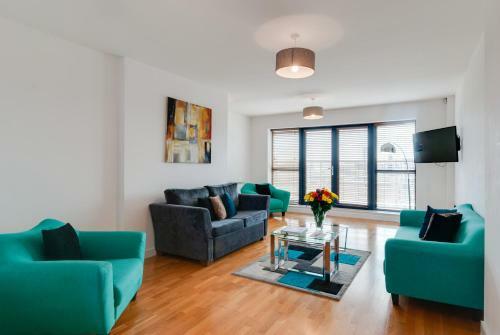 Lock in a great price for Base Serviced Apartments - East Village – rated 8.9 by recent guests! 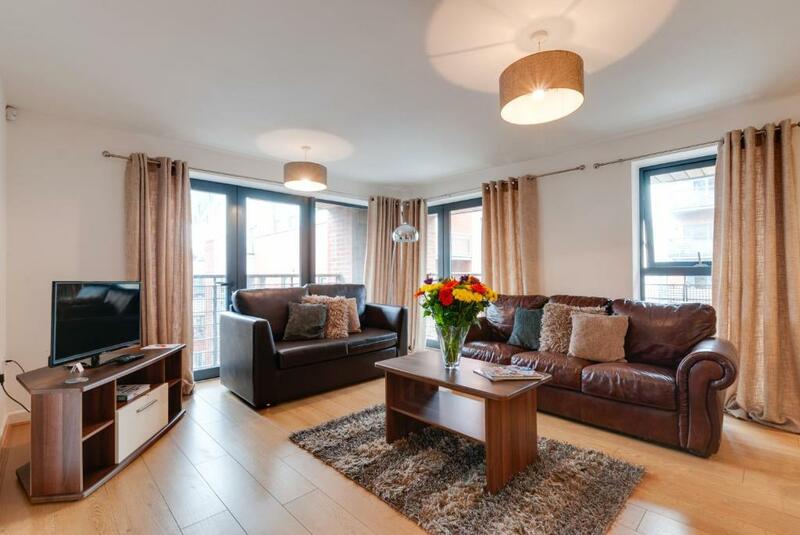 Base Serviced Apartments - East Village This rating is a reflection of how the property compares to the industry standard when it comes to price, facilities and services available. It's based on a self-evaluation by the property. Use this rating to help choose your stay! 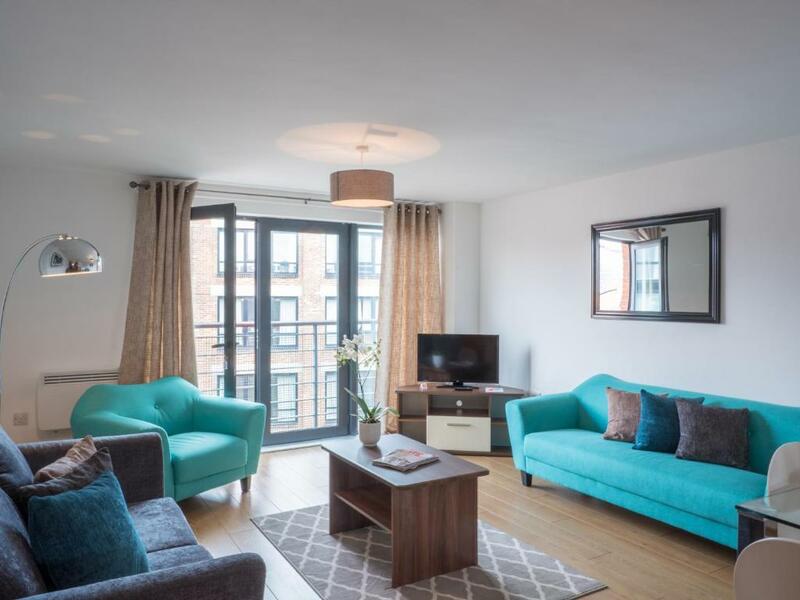 One of our top picks in Liverpool.Located in the heart of the city, Base at Duke Street is just a 10-minute walk from Liverpool One and on the doorstep of Liverpool’s Cathedrals. The historic Chinese Arch is Just a short walk away and Liverpool’s Royal Albert Dock, Echo Arena and Convention Center are a 15-minute walk from the apartments. All serviced apartments feature stylish well-equipped kitchens with laundry facilities, along with widescreen TV’s and living spaces. For added luxury, the penthouse offers breathtaking city views. With bespoke, contemporary interiors, the apartments are ideal for families, leisure and corporate guests alike. Liverpool’s famous Concert Square and trendy Baltic Triangle are both within 10-minutes walk from the property. For football fans, Anfield and Goodison Park football stadiums are just a 10-minute bus or taxi ride away. Check-in is just a 10-minute walk from Lime Street station and secure on-site parking is available on a first come first serve basis. When would you like to stay at Base Serviced Apartments - East Village? 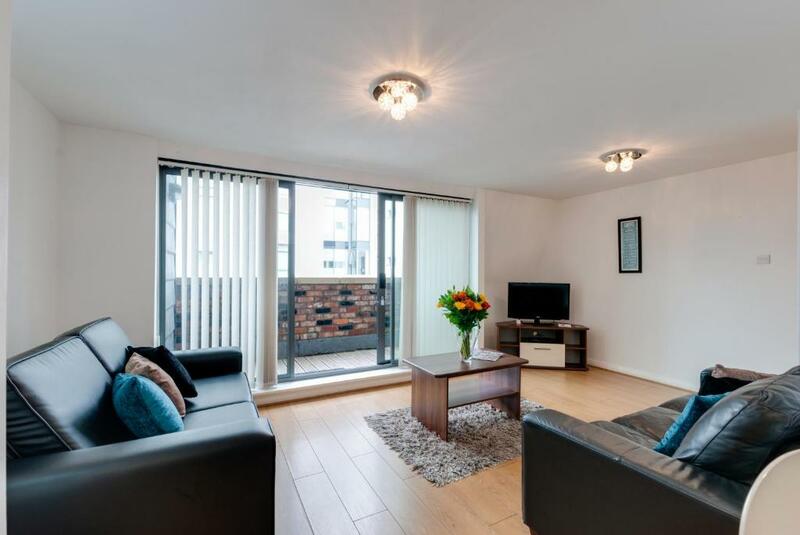 This apartment includes a fully equipped kitchen with a dining area, as well as a living room with a flat-screen TV with a DVD player and ironing facilities. The bathroom is fitted with a bathtub or a shower and a hairdryer, and free Walter Geering toiletries are provided. 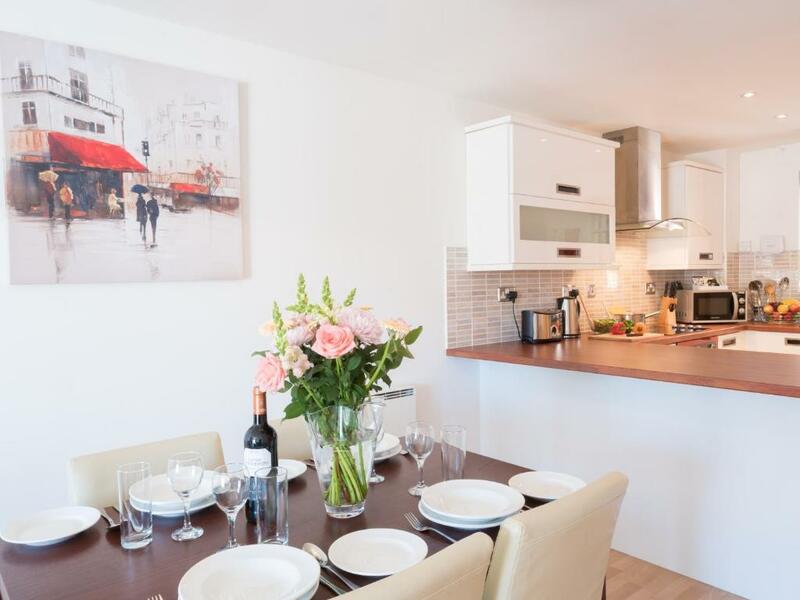 This apartment includes a fully equipped kitchen with a dining area, as well as a living room with a sofa bed, a flat-screen TV with a DVD player and ironing facilities. The bathroom is fitted with a bathtub or a shower and a hairdryer, and free The White Company toiletries are provided. This apartment includes a fully equipped kitchen with a dining area, as well as a living room with a sofa bed, a flat-screen TV with a DVD player and ironing facilities. The bathroom is fitted with a bathtub or a shower and a hairdryer, and free Walter Geering toiletries are provided. This two-bedroom apartment features a spacious living area with a sofa bed and a full kitchen, along with a dining area. It has 2 bathrooms and stunning views of the city's skyline from the private balcony. 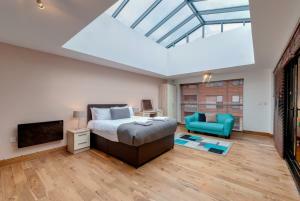 Guests can enjoy views of Liverpool's Anglican Cathedral and the famous Liver Birds. This penthouse duplex apartment with a balcony includes a fitted kitchen with a dining area. There is a spacious living room with a sofa bed and a large flat-screen TV with a DVD player. The apartment is split over 2 levels and offers 3 double bedrooms with Egyptian cotton bed linen. A hairdryer, towels and ironing facilities are provided. There is also a double sofa bed in the living room for additional guests. 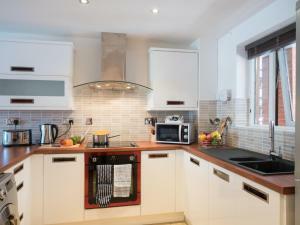 The fully equipped kitchen has an oven, a fridge/freezer, a washer/dryer, and a dishwasher. The apartment offers views of the city's skyline from the private balcony. Guests can enjoy views of Liverpool's Anglican Cathedral and the famous Liver Birds. 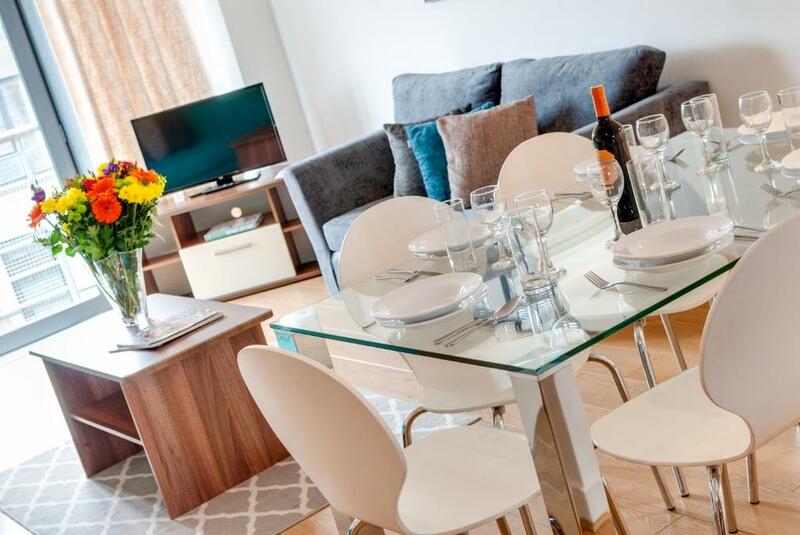 Situated in a fantastic city center location, our East Village apartments are ideal for families, corporate, or long and short term stays. Great for those wanting to relax and unwind, we offer a choice of one, two or three bedroom apartments, fully equipped and fully serviced ready for when you are. Ideal for accessing the cities amenities and places of interest. At the very core of Base’s success is its dedicated sales team, who work tirelessly to bring their clients the very best in property management. Within the team, there is varied experience in hospitality, property sales, digital marketing and revenue management. There will always be someone on-hand to take away the stress and ensure you have all you need for a wonderful stay. Lime Street train station is a 10-15 minute walk away; while a brief 5-10 minute walk will see you arrive at Liverpool One shopping centre. Other local hotspots include: Chinatown, Ropewalks area, The Anglican Cathedral, University of Liverpool, city centre, Albert Dock, Everyman Theatre, Royal Court Theatre, Liverpool Philharmonic Hall. House Rules Base Serviced Apartments - East Village takes special requests – add in the next step! Base Serviced Apartments - East Village accepts these cards and reserves the right to temporarily hold an amount prior to arrival. The cardholder must be present at the time of check-in. Check-in times are between 15:00 and 23:00 at the office. Alternative arrangement can be made for all check-ins after this time, but they will incur a fee of GBP 20 and must be arrange at least 24 hours prior to check-in. The office is located in Hudson Gardens - Duke Street and all keys must be collected from there. Management reserve the right to request a photographic ID and to pre-authorize a security deposit on a credit/debit card from GBP 50 to GBP 250 per person upon arrival (subject to an individual reservation). Please be advised that cash, Visa Electron, Solo or Laser cards are not accepted as a method of payment or for a pre-authorization. This money is not a charge and no funds will be debited from your account, however, your bank statement may show the pre-authorization as a ‘pending transaction` for up to 28 working days. Only thing I could complain about is that the double bed is a bit narrow for a fully grown couple :-) And I would recommend a nice sitting chair in the main bedroom with a reading lamp. That would be a great touch. Very nice apartment on two floors as we got the penthouse apartment. Bedrooms on first floor and living room and kitchen on the second. Great view from a very, very tiny balcony. We could have sat out there though if the weather had permitted that. Location was great, only fifteen minutes easy walk to Albert Dock and 10 to the main shopping district. We would like to recommend the Greek restaurand Zorba which is close by. Excellent food and great service, don't miss that one. Location near to the city centre. They are many Restaurants near to the hotel, and also under the hotel. Good Internet, apartment had everything we needed. friendly and very helpful staff, ease of access to city centre and a pleasure to stay with you. We will return again. Nice, clean, comfortable and morden apartment. Very well located in the city centre, helpful and politr staff. The security deposit seems slightly excessive. Really good apartment. Clean and comfortable. Good location. No hot water only luke warm -to cold. Some of the heaters weren’t working making it cold at night. Everything you needed was available in the apartment as in appliances. Felt safe in the apartment, nice and quiet even with having a road facing apartment. Was close to the docks, shopping centre and tourist attractions, was easy to locate apartment building. Very friendly staff . Great location . Clean . Nice extra touches ; they gave my daughter an Easter egg . We left stuff in the flat and they sent it onto us next day delivery and didn’t charge us !